In a country like Saudi Arabia which often times makes its way in the news because of perceptions of its ultra-conservatism and status of women in society (where none are permitted to drive, except that a few months ago, women led their first organized attempt to protest the ban by driving on the same day and posting those videos on YouTube for the world to see), one woman truly stands out as simply remarkable. 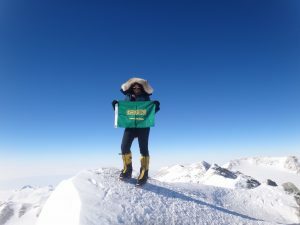 Raha Moharrak, an ambitious 27 year-old, became the first Saudi woman and the youngest Arab to successfully summit Mount Everest on May 18th 2013. She was part of the Arabs With Altitude team that was bidding for the summit to raise a million dollars for education in Nepal. 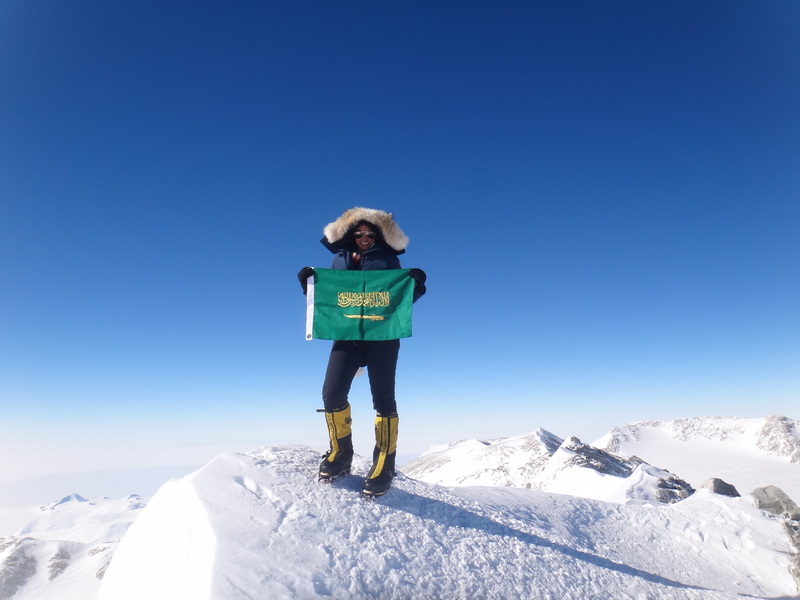 When she set out on her expedition from Base Camp, though, she had no idea of the responsibility that would come with raising the Saudi flag on the peak of Mount Everest. Such incredible feats bring with them incredible responsibilities. 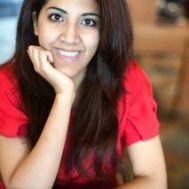 Raha has come to realize that she now can influence people around the world and portray Saudi women in a positive light. But this young lady did not set out with a political agenda when she was standing at the bottom of Everest looking up a year prior to her bid for the summit; she did this because her heart and soul needed something different at the time. With only a month and a half of training on her own, Moharrak remembers her first experience climbing Kilimanjaro as one that came with great challenges and a bout of hypothermia. But after standing at the top of the mountain and seeing the extraordinary view, she knew she was hooked on mountaineering. “When you stand on the summit of a mountain, especially Everest, you automatically have a link because we all know what it meant to attempt it,” she says. Climbers become a cohesive family, working together towards reaching the summit and supporting one another as they go through the same emotional and physical trials that come with such a demanding activity. Rookies in the mountaineering world must be prepared to push their bodies beyond any limits they thought they had and push their minds even further than ever before. Moharrak, who now specializes in high altitude glaciers, advises those who wish to take on the activity that this is no walk in the park. Mountains are greatly underestimated, especially in the MENA region where access to the activity is non-existent . “Climbing is not a sport you do in the region, considering that it’s quite flat and quite hot here,” she says. 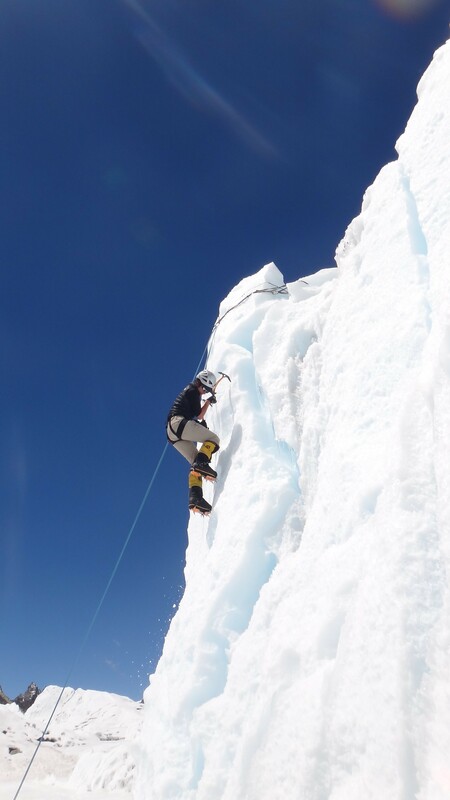 In preparation for her expedition on Everest, she traveled a lot for training and climbed back-to-back mountains in order to get the altitude experience.. “No one really thinks about climbing in the Arab world,” Raha says. Raha is the first woman from the Gulf and the second woman from the Arab World out of a total of ten Arabs that have climbed Everest. But to those daring and dashing enough to take on the challenge of climbing the highest peaks on earth, Raha advises against underestimating the mountain and the climb. This challenge comes with risks. So future mountaineers need to be mindful of the fact that they are putting their bodies and their minds through exhaustion. According to Moharrak, one key to success is to never be afraid to fail. “When I decided to go to Everest, I said I would attempt it and I meant the word attempt not conquer, you don’t conquer Everest,” she says. Taking that attitude to heart, Moharrak reminded herself that if she were to get too tired or couldn’t make it to the top, the mountain was not going anywhere and she could try again next year. She adds that the reasons for climbing the mountain are essential for a successful climber because they will need to remember them at every moment when they are up there suffering but still pushing forward. “Do something because your soul needs it and your heart went after it,” she advises. Looking back on the days when she first proposed the idea of climbing Everest to her father, she remembers the aggressive campaign she mounted to convince him that this was her calling in life. “You don’t ask for Everest, you say I want Everest and this is why,” she says. It comes as no surprise that when Moharrak made headlines as the first Saudi woman to summit Everest last May, there were mixed reactions from Saudis. “The majority of people were very supportive, understanding and even excited about the whole thing and this is definitely not what I expected at all,” she says. She received a great deal of positive feedback including being honored by the Saudi government at a ceremony held by the General Presidency for Youth Welfare in Riyadh. On the other hand, there were those that were not so supportive. And while there will always be those who judge others and condemn them for how they live their lives, Moharrak knows that she made the right choice when she sees the pride in her father’s eyes when she’s discussing her expedition in a public forum. Her most unforgettable moment was when she finally was able to speak to her father a whole fifteen hours after summiting Everest. Her parent’s reaction and support comes as a confirmation that she made the right choice and alleviates any regrets that she may have had in being so aggressive in her pursuit of her passion. As she continues to find ways to achieve the extraordinary, Moharrak continues to work as a graphic designer and attend as many social events as possible. 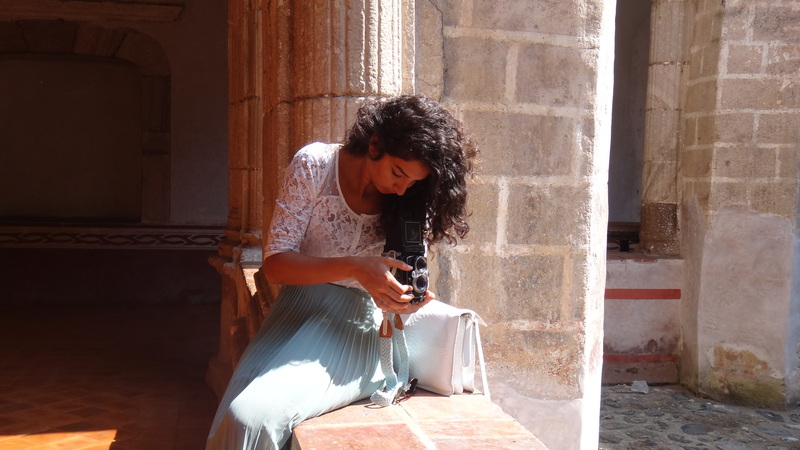 She has managed to create a balance between her work, social life and her passion. Meanwhile, she is hoping to shed more light on the positive side of Saudi women. Moharrak feels that Saudi women are underestimated by both their surroundings and themselves. She knows the impact her expedition has had on many young girls and even adults living in Saudi Arabia, who now look up to her and are inspired to achieve their own dreams. Moharrak is in a position where she can influence the next generation of women, and she is taking every opportunity to do so. “Saudi women are capable of amazing things, we just need the courage to actually go beyond having a dream and actually live it,” she says. Why do you think that there is a lack of interest in this activity on the part of the people of the MENA region? Do you think it’s because people are scared to go there? We just don’t have it in our minds, kids don’t grow up aspiring to be alpines, it just doesn’t happen here. It’s not in their field of interest. Both my parents had the hardest time when I told them what I wanted to do. My dad knows me well so from the moment I told him I wanted to climb Kilimanjaro, he told me okay but don’t ever tell me Everest. Less than two years later I was explaining why I needed to climb Everest. Other than your immediate family, what was the reaction of your peers when you embarked on your expedition? The people that know me weren’t surprised when they found out that I had climbed Everest. I had initially told about four people other than my immediate family that I was going to attempt this expedition. So those were the only people that knew I was up there. When it hit the news and everyone heard about it, everyone that knew me knew it was me up there. My scuba diving instructor was in Costa Rica at the time when he saw the headlines of the first Saudi woman to summit Everest and he immediately knew it was me. The people that know me weren’t very shocked when they heard the news to be honest. Coming off of that do you think it takes a special kind of personality to do these things? Definitely, it takes a certain type of discipline to get there, a certain type of mentality to survive and a certain type of attitude to come out of it with friends. You’re stuck on a mountain for so long, you’re hungry, you’re tired, you don’t have a single toenail left on your feet and you have to play nice. So it takes a certain kind of attitude and spirit to get along with people who are going through the same things as you. It’s uncomfortable being up there that long, living in a tent and not being able to shower properly, you get one bucket every ten days so it takes a toll on you when you’re there. It’s a combination of things that need to come together for you to be a successful climber, teammate and summiteer. You have to rely on the people around you. They become your family so you really need to be able to get along with people around you. I’m a very strong willed young lady so you can imagine how some of the guys felt. You can’t go through this halfhearted, you throw yourself in to it and it’s a challenge that affects every inch of you, body, mind and soul. There’s no room to be weak or not to be completely invested in this. So do you think that not everyone can do it? I’ve learnt never to tell anyone that they aren’t capable of doing something because I don’t like people telling me I can’t do something. I do however warn people when they think it’s a walk in the park. I warn people about all the mountains I’ve done, even the easiest and the simplest ones because mountains are underestimated surroundings and a lot can go wrong. People think too highly of themselves sometimes and they make stupid mistakes and I’ve seen that happen many times so I’ll give them as much advice as I can but I’ll never tell someone that they can’t do it. A lot of people think that it’s a very easy thing to do and although I’ve climbed many mountains, I still consider myself a student and will take every opportunity to learn when I can. I don’t really look like a mountain climber and I don’t present myself as one so many people underestimate you, they’re boys! One time, someone saw me on the mountain and asked “who’s Barbie and what the hell is she doing on the mountain?” so I told him “don’t let my Disney princess hair fool you”. These comments only fuel me to want to push to the top and show them and myself what I’m truly capable of. What was the source of inspiration that contributed to your need to do such extraordinary accomplishments? I can’t take much credit for how any of these things turned out. I’m very fortunate and very lucky to have such great parents, who listen and I’m very lucky to have this type of personality that is really bold. I can’t take any of the credit though because I don’t know where this started but I’ve always been very stubborn and very curious, I continuously fed my curiosity and I think that that’s where we lack as adults. I nurtured my curious nature and turned it into something that I use to propel me forward. My parents helped immensely, they listen and when they realized I was really hyper they put me in a dance class and when I wanted to dive they gave me the tools; then I did horseback riding. So they never said no, they gave me the room to experience and to live and I’m very fortunate for that. People limit their children but my parents never did, they were very open in terms of listening to what I wanted to say. Photos courtesy of Raha Moharrak. Featured image courtesy of Elias Saikaly.